Summary of this Paper: Here, a particular engineering task-automated treatment of the curved line group is addressed, and then used to consider a new trend – the shifting calculations from the PC workstation to the Internet Server. 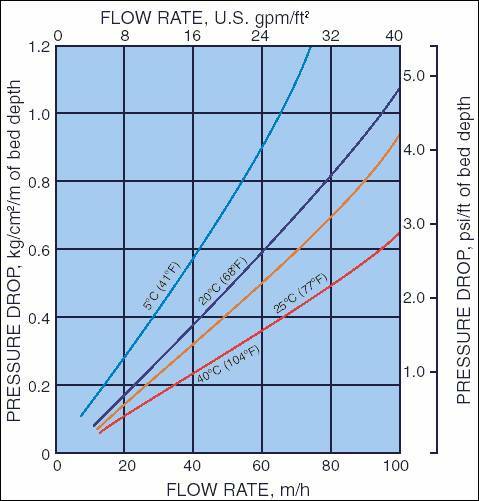 Picture No.1 presents a graph which shows the unit hydraulic resistance (pressure drop) imposed on flowing water as a function of the water flow rate and water temperature. The figure reveals that the hydraulic resistance increases with an increase in flow rate, and decreases with an increase in temperature. This and similar graphs are often given for the description of different processes as well as for their quantitative evaluation, i.e. for calculations. This picture is used with a permission of a prominent company specializing in water treatment equipment and has been extracted from the company’s technical documentation. In the above mentioned company’s technical documentation, a «trace along the curve graph» method is suggested for the determination of the hydraulic resistance. This simple procedure can be described as follows: plot the magnitude of the flow rate along the x-axis (using some scale), plot the isotherm curve (interpolating, if necessary, from the existing ones) and find the answer along the y-axis. Different reference sources quite often employ a variety of nomogram charts, which have to be dealt with in a specific manner like this one: The first argument (input variable) goes onto the left scale, and the second argument to the right. The two argument points are connected and the answer found where the connection line intersects the intermediate scale (see one example on the «live» nomogram on MAS). Generations of engineers have used such nomograms with feelings of gratitude for their convenience, but with the loss of accuracy and too the physical side - the essence of the problem. Even some simple and cute mechanical devices (similar to the slide rule) have been manufactured (with the built-in methodology of calculation hidden from view and the answers obtained from pull/push hand movements). At one time, these gadgets were especially popular among air/sea navigators. It’s interesting though that, even now, some newstands in the downtowns of big cities sell two-disc devices which ask for your weight and height and then give you an idea if your weight is acceptable (presumably, not too heavy). · Firstly, a noble desire to free the user from dull and tedious calculations keeps the author from writing the equation for a calculation. This is especially true, when the objective is not a precise calculation, but just a quick, rough approximation. Consider the water treatment company, mentioned at the beginning of this writing. We give, as an example of such rough approximation, their methodology for specifying a pump for a filter (its pressure is mathematically a product of the unit hydraulic resistance by the layer height). The company documentation recommends an arbitrary increase of the design hydraulic resistance by an amount of 10 to 20% (the so called safety factor to compensate for, on top of different miscellaneous mishaps, the inaccuracies of getting the numbers by the «tracing along the curve» method. · Secondly, quite often the mathematical relation between variables does not exist in equation (or perhaps any other) form, or what has been given in the charts is only a graphic interpretation of empirical results, possibly with the help of asymptotic curves. The curves shown at the picture No1 were derived after filtering the material using a special test stand with a special control over the flow rate, and then measuring the water temperature and pressure drops. Scientific books (not engineering reference sources) generally recommend that graphical presentations display the experimental points at intervals suitably spaced for interpolation. The latest trend includes the links from the scientific research articles to on-line web sites, where the original experimental documentation is saved. Readers then have the means not just to verify the author’s conclusions, but also to develop his/her own interpretation of the results. It is now even possible to advance and refer to a program, containing a calculation, corresponding to the graph curve. · Using available graphs for different (but similar) conditions, derive the results for the conditions of interest using the spline interpolation. The Mathcad application package offers built-in functions (lspline, pspline, cspline and bspline) for the spline-interpolation of a tabulated function of one or two variables. But dealing with functions of two variables is a bit difficult: these functions require that the initial tabular data be square (i.e. where number of points of the first variable is equal to the number of points of the second variable). More generally, the tabular data tends to be rectangular. Unfortunately, “squaring” the data through truncation reduces accuracy. · The input values can be presented by dimensioned quantities (unlike the case of a general Mathcad matrix operation) because they will be turned into dimensionless ones at the beginning of the procedure. The size of the input matrix can be changed to accomodate all available information. · The desired pressure drop has been programmed as a user’s function named DPd (math symbol to be used here). · The graph will show the «original» curves and the desired curve for the temperature specified as an input value. · The spline-interpolation information is given at the picture; it includes the parameters required. · The solution can be obtained in a variety of units as well as symbolic form. · Users don’t need to acquire Mathcad itself (it can be expensive, illegal or both). · Data drivers can be easily updated and/or corrected on the MAS Server. Data files distributed for exercising Mathcad worksheets are not easily managed and often become obsolete. · Mathcad is a mature application software product which has been used over the years to solve numerous kinds of problems. The corresponding Mathcad Worksheets can be easily revised, updated and edited as required, and made available on the MAS.